April 2018 – loudlatinlaughing – Euge! Euge! 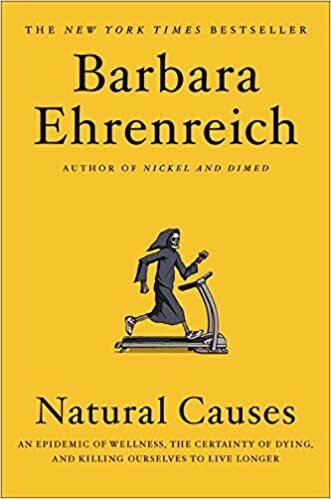 Great idea for a book but poorly executed by Ehrenreich in a very meandering disjointed way. Chapters have no connection to each other, although a few of them stand out as solid on their own (and perhaps would better live as standalone essays). Naturally, she shines in her scathing comments about the idiocy of Silicon Valley where bros create a problem (addiction to screens & attention issues) and then solve it with meditation apps. I like what I thought was going to be her main focus of the book, a walking away from all the tests, pokes, and prodding of modern medicine; once she realizes that she’s “old enough to die,” she’s “no longer interested in looking for problems that remain undetectable to [her].” Very few people seem brave enough to voice this idea that time is better spent doing what you love in the little remaining time you have, rather than in waiting rooms of doctor’s offices for endless tests just looking for issues to jump on. I like the idea that some doctors have adopted of tattooing DNR or NO CODE on themselves so they don’t have to suffer the drastic end of life measures they proscribe to their own patients. At the very least, I got leads for some other potentially good books on aging, such as Betty Friedan’s The Fountain of Age (incorrectly listed in this poorly fact-checked book as The Fountain of Aging) and Lynne Segal’s Out of Time. I wonder if you get health benefits simply from reading this book. 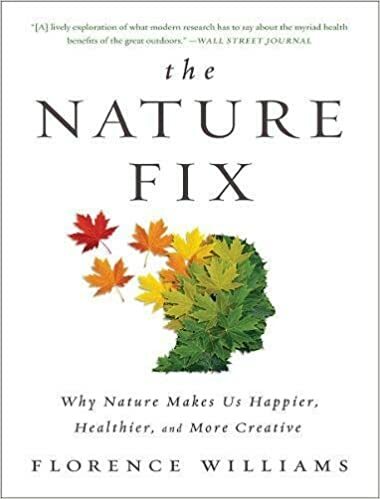 Florence Williams covers a lot of scientific ground in her exploration of how humans react to nature in ways that reduce stress and make us more sane and healthy. The senses are scrutinized individually: smell (aromatherapy benefits of tree exhalations), sound, sight. Brain waves are measured with EEG machines in the field. Surveys are meticulously taken. Fists are shaken at the omnipresent planes flying over her house in DC with negative comparisons to her previously idyllic life in Colorado. I began to weary a bit of the attempt by science to pry out the mystery of why nature helps us and was happy when stumbling on Williams’s own misgivings: “I find the intellectual compulsion to break apart the pieces of nature and examine them one by one both interesting and troubling. I understand it’s the way science works… [but the] poets would find this is nonsense.” All of her encounters with virtual reality simulations of nature in the experiments seemed to be a bust, nothing can compare to the sensations of being outside. She travels around the world, citing pithy quotes from Edward Abbey to Frederick Olmsted to Ellen Meloy to Wordsworth (Bill AND Dorothy!) to Thoreau to Emerson and Whitman (why no Annie Dillard? ), forest bathes in Japan, desert hikes for 3 days with a group of university students, whitewater rafts for a week with women veterans recovering from PTSD, and much more. There’s evidence that “more introverted or neurotic people are more annoyed by loud noises” than other people are. Fantastic. Our brains are similar to birds in the parts that hear, process, and make language. “Humans share more genes governing speech with songbirds than we do with other primates.” This may help explain why we have a “primal affiliation” with bird sounds that soothe us (if you don’t hear birds, something might be wrong). Fight for proximity to a window wherever you are: hospital, office, etc. Even Florence Nightingale’s 19th century nursing textbook showed the importance of light second only to fresh air. Alone or with friends? Psychologist Wohlwill wrote that “natural environments experienced in solitude seemed especially restorative to people who are mentally fatigued or socially stressed.” But research suggests that if you’re depressed or anxious, social walking in nature helps if you’re with people you like. It’s better to be alone if you want to boost creativity, self-reflect, or solve problems in your life. Exercise of any sort is beneficial; physical activity changes the brain to improve memory, slow aging, improve mood, lower anxiety, help depression. To combat self-wallowing, get out into nature to see that the universe is bigger than you. A love letter to NYC in the best possible way. 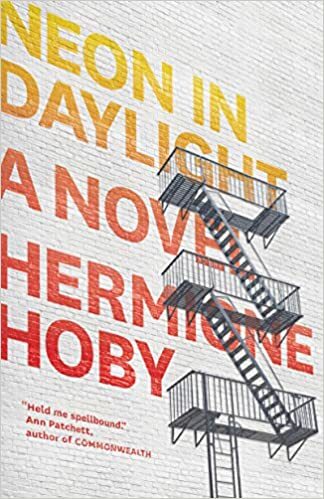 A woman escaping from her stifling post-grad life in London stumbles onto a 6 month house/cat-sit and discovers herself while falling in love with New York. Kate, the narrator, changes with each experience, growing more unpredictable as she downs drugs and sheds inhibitions. The best parts are the meaty bits I love about NYC, the grimy hot summer, the sweaty subway, the people packed and interesting. The flimsier part of the book is the wobbly plot structure—Kate sees Inez in a bodega on her first jet-lagged night, buys the same brand of cigarettes as Inez, then (serendipitously!) Inez runs into Kate in Washington Square and asks if she’s the Kate looking to buy Adderall. No, but (gasp!) her name is also Kate, and thus begins a friendship. Another coincidence—Kate meets Bill (famous old author) at a gallery party and gosh if he isn’t Inez’s father! The hubbub comes crashing to a climax at a Halloween party where the three end up and Bill’s old Warhol-factory-pal shoots himself on his 88th birthday. Terribly clever reworking of ancient fairy tales with a gender-bending twist and a modern huff of paint. Some were good, like the recognizable elements of Cinderella, Beauty & the Beast, Little Mermaid. All are dark and perhaps this is a bit too much to thrust into a young-un’s hands. Nothing I’d much want to linger over or re-read. Ortberg puts the Grim in Brother’s Grimm, but the trick seemed tedious at times (see: the Mr. Toad story). Sybille Bedford continues the fictionalized narrative of her childhood, picking up where A Legacy left off. She’s still a child, maybe nine years old, when her mother sends for her (she’ll never see her father alive again, he dies a few months later after an appendix operation). Thus begins life acting as the adult in the room, managing on her own when her mother deserts her for the weekend to run off with a lover. They are near Switzerland, then discover a small town in the south of France that ends up being their headquarters, Sybille running off to England to get schooled during the year. Fascinating tales of a young girl fending for herself in London on a tiny income that comes from her father’s estate, managed by some German firm until she turns 21. After a few years of being pawned off on friends of her mother’s, Sybille takes a bed-sit near her friend Rosie, wanders museums and teaches French to clerks for money. The summers are in the south of France, a meeting of the Aldous Huxleys is accomplished, her mother turns into a morphine addict after her young husband falls in love with someone else. At the end, she’s reverted back to using after an ineffectual cure, and her husband leaves her in Sybille’s hands to care for. Another lovely tale of escape from Katherine Mansfield’s cousin Elizabeth. 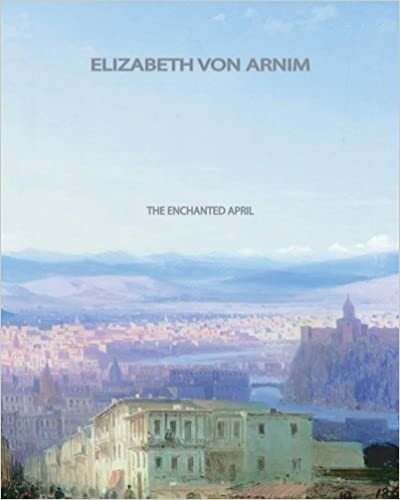 In this story, an Italian castle is rented out for the month of April and two youngish women having problems with their husbands meet and decide to take it as a rare treat to themselves. They recruit two other women, one an impossibly gorgeous blue blood with pots of money and the other a stiff old woman (also with pots of money) who is unbearable in her insistence on name-dropping all the literary celebrities she knew in her lifetime. Lotty (one of the wives) changes overnight in the fresh Italian spring air, blossoming and insisting on inviting her disapproving husband immediately. He shows up and is actually decent because he plots to recruit the rich ladies as clients for his business. The other wife, Ruth, moons about hopelessly about her memoir-writing husband who’s been living an alternative life in London away from her, decides to invite him at the last minute, and he shows up in pursuit of Lady Caroline not having received Ruth’s letter. The castle’s owner shows up and falls for Caroline and in the end it’s happily ever after with couples abounding. This is a book all Americans are guaranteed to hate. If, like me, you’re a reasonable person who doesn’t enjoy feeling slayed by the staggering amount of corruption spilling out of McDonald Tr*mp’s administration, you’ll hate being reminded in minute detail about every single infraction that has occurred since 11/9. If, like most soulless Republicans (redundant? 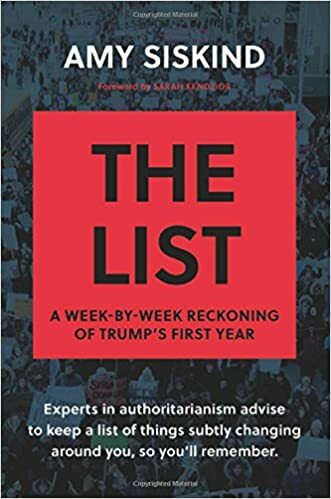 ), you don’t want to see a catalog of your hero’s worst hits mercilessly scroll out page by page over the year following 11/9, you’ll hate this meticulously created list of things that have been changing in our pseudo-democracy. But I couldn’t finish it. It is, as Carol Anderson says, “a brutal, necessary mirror.” I could only read a week at a time and my blood pressure would spike. I made it to Week 17 and couldn’t continue the self-flagellation, the emotional cutting. Thank you, Amy Siskind, for doing this hard work and staying on top of all the things that I’d already forgotten. I cry mercy, uncle, whatever. My life feels shortened even by living in the months post-11/9 and the pace accelerates by reading each of these offenses. These are the pin pricks that drain life away. Perhaps I’ll return to this in happier times to plow through with a smirk of oh-my-god-I-forgot-about-that. Or maybe things will get worse and this volume (I’m assuming she’ll do a follow up for Year 2) will be a ray of Good-Old-Days. I hope not. Richard Kennedy was 16 when he went to work at the Hogarth Press. 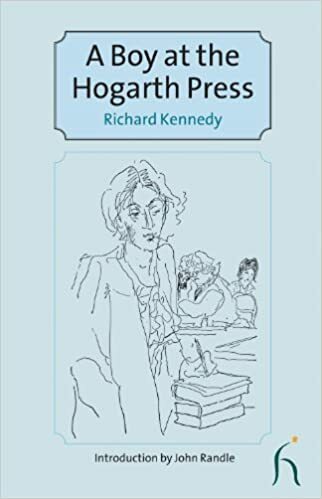 This book is a pseudo-journal, recollections jotted down decades after the experience, describing the more mundane side of Leonard and Virginia and peppered with Kennedy’s own drawings. This shows Leonard’s temper in action when confronted with the petty cash book not adding up correctly. This classic work from Betty Smith should be a must-read for anyone with command of the English language. 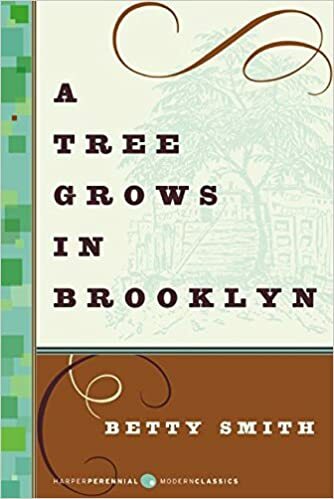 Her brilliant portrayal of Brooklyn around the turn of the 20th century is vivid, detailed, and somehow uplifting in its poverty. Frannie’s mother cleans homes to keep the family afloat while her charismatic father occasionally picks up singing waiter gigs and spends his tips on drink; the family plays a game they call North Pole Explorer where they have to subsist on whatever is in the cabinets for days, sometimes approaching utter starvation. Frannie and brother Neely collect junk and carefully count their pennies. The mom (who prefers Neely over Frannie) has an idea that education will get them out of poverty, so she makes the two of them read pages from Shakespeare and from the Bible every night, starting over again once they finish. Frannie says she prefers eating a raw potato to a raw apple?! After the dad (Johnny) dies, Frannie must leave school to bring in money to help the family, including her pregnant mother. First employed in a factory making artificial flower stems, when that work dries up she lands a gig at a press clippings agency and later as a telegraph operator. 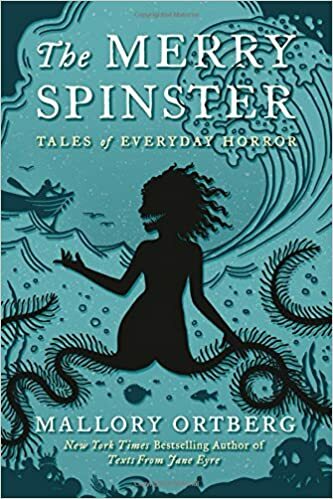 There’s heartbreak and squalor and soaring spirits and everything in between, like Frannie’s life lessons of becoming a woman and her writing that sustains her (despite a teacher calling her stories “sordid” because the poverty was too realistic). Everything happy-endings as you would expect, with Frannie’s pretty mother remarrying an upstanding wealthy citizen and Frannie happily-ever-aftering herself into college at Univ of Michigan. Books get shuffled off to the library archives when they’re no longer being requested, and I probably should have refrained from dipping into this one based on that knowledge. 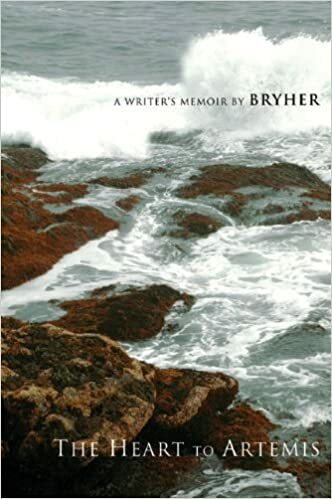 This is not a writer’s memoir, this is a hodgepodge of reminiscing about Bryher’s childhood (why does that part invariably end up being excruciatingly boring?) growing up in Kent and London; her extremely privileged early years traveling with her parents to Paris, Italy, Greece, Egypt; some time at school; stumbling onto H.D.’s world (which I think is why we’re still curious about Bryher, her being H.D.’s long time lover); plus the swirl of between the wars life in Paris (Gertrude Stein, Hem, Joyce, Sylvia from Shakespeare & Co… the usual). 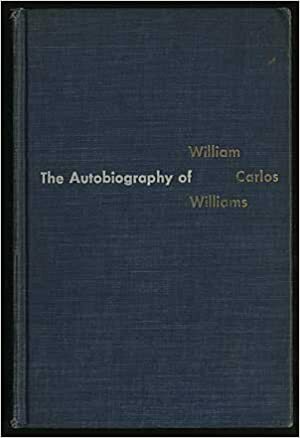 She rakes William Carlos Williams’s Autobiography over the coals (where I originally heard of her), noting several derogatory statements he made and wanting to file a lawsuit against him but cautioned not to so as not to increase interest in the book. the atmosphere seemed full of gold. There was a table piled with books and beyond this a high chair where Gertrude sat, surrounded by a group of young men. At first there was little general conversation, then she would pick up a phrase and develop it, ranging through a process of continuous association until we seemed to have ascended through the seven Persian heavens and in the process to have turned our personalities inside out. Make no mistake, however, it was not an ego selfishly seizing the stage, it was rhetoric, spare and uncolored by emotion. She offered us the world, took it away again in the following sentence, only to demonstrate in a third that it was something that we could not want because it had never existed. How bitterly I regret that there were no tape recorders then available to preserve her disputations. Also of interest are her descriptions of travel in 1900. How can I make people understand what the trip was like fifty years ago [in 1901]? There were no motorcars, we traveled by steamer, train or horse-drawn carriage, sometimes we rode. There were no passports, I had my first one in 1919, nobody spoke English but French was a lingua franca everywhere and, if necessary, in remote districts, we drew pictures of what we needed. The trains were dusty and unheated, occasionally porters brought round “foot warmers,” long metal cylinders filled with hot water, but my legs were too short to reach them so I was wrapped in a rug. There were no dining cars at first (I resented them when they arrived, it was much more fun to picnic in the compartment) and no baths nor running water taps in the hotels though enamel tubs were brought to us with cans of steaming water… we wore tiny muslin bags full of insect repellent sewn into our stockings and vests. Occasionally good but not worth losing your mind over. 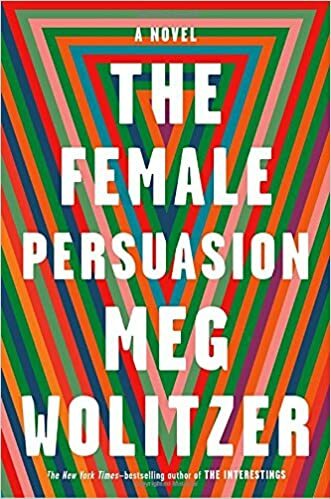 Wolitzer excels at packing a novel full of characters you want to know more about, whose threads you eagerly follow to the end of the book. Fascinating to see your own response to the twists, like when Greer is handed a letter by her friend Zee to Faith Frank but she doesn’t want to give it to Faith because Greer is just starting at the foundation and wants to swim on her own without the weight of her friend tagging along (but would Zee do that in real life? I’m unconvinced). Or when Cory (Greer’s boyfriend) gets shipped to Asia for a consulting job, you completely expect things to fall apart, but not in the way it happens (Cory’s brother gets killed by his mom running him over accidentally, Cory abandons job and tends to distraught mom). 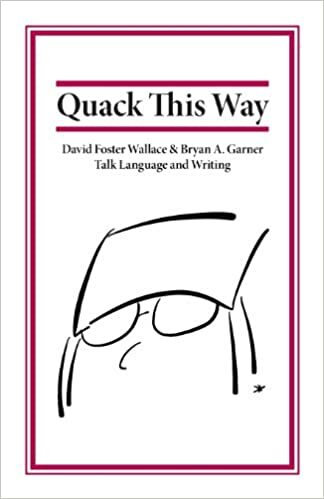 I love that Wallace considered himself a journeyman of writing, someone skilled at a craft from having worked his way day-in and day-out, honing, struggling, showing up. He revealed that his process for writing the long form non-fiction essays took him about six months with obsessive notes and several drafts before he figured out what it was he wanted to say. Learn to pay attention in different ways, such as the exercise where you take a book you like, read a page 3 or 4 times, put it down, try to imitate it word for word to feel your own muscles trying to achieve the effects of the text. It will be in your failure to duplicate it that you learn what’s going on. This beautiful book is a miracle. To be able to write a compelling and well-researched book about recovery—a subject everyone’s else glaze over when you bring up—is extremely hard. 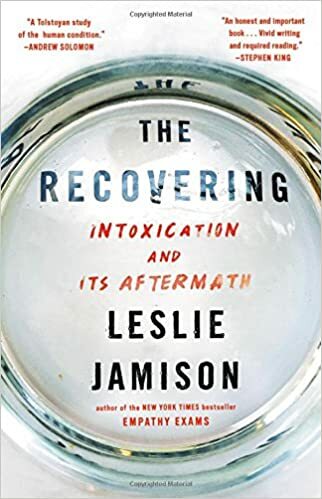 Leslie Jamison does an astonishing job at making this interesting, weaving her own story in among the many tales she picks up at AA meetings in her constant struggle to remain sober. Interspersed among this are literary nuggets as she tries to demystify the notion that writers must be drunks to get gold to gush from their pens, holding up Raymond Carver as a shining example of one who was able to write in sobriety (ending her book with a pilgrimage to his grave). 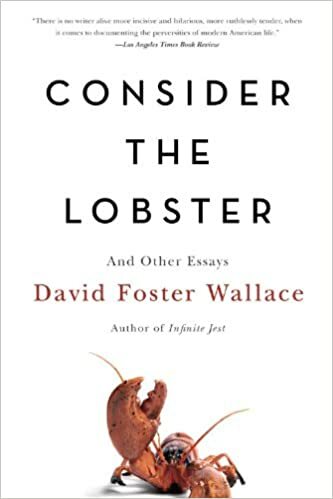 David Foster Wallace is among the pages and she credits reading Infinite Jest as a crucial support system during her early months of sobriety. He called booze “the interior jigsaw’s missing piece.” Brutally honest about her own depths of depravity, she shows us the ugliness of her scheming to drink whenever her boyfriend is away from home, how solo cups filled with whiskey prevent her from making progress on a book she’s supposed to be writing about the Sandinistas, the dirty tour of despair through Iowa City and New Haven on the road to recovery. Author lzPosted on April 10, 2018 Categories Reading ArchiveTags YES! “Russ comes over to me and goes, ‘Scotty, I been watching you. I like your style. I’m a good judge of people, and Scotty, you’re good people. I never heard one person say one bad thing about you. 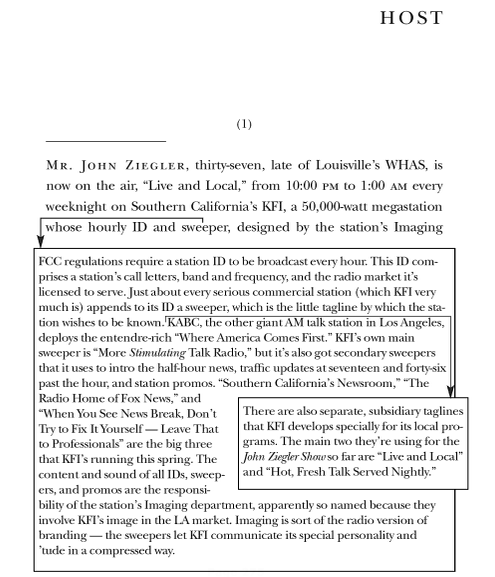 '” [Keep in mind that this is Scotty telling the story. Note how verbatim he gets Hampshire’s dialogue. Note the altered timbre and perfectly timed delivery. Note the way it never even occurs to Schwartz that a normal US citizen might be bored or repelled by Scotty’s lengthy recitation of someone else’s praise of him. Schwartz knows only that this interchange occurred and that it signified that a big fish approves of him and that it redounds to Scotty’s credit and that he wants it widely, widely known. ]… What is the socially appropriate response to an anecdote like this—a contextless anecdote, apropos nothing, with its smugly unsubtle (and yet not unmoving, finally, in its naked insecurity) agenda of getting you to admire the teller? As I see it, it probably really is good for the soul to be a tourist, even if it’s only once in a while. Not good for the soul in a refreshing or enlivening way, though, but rather in a grim, steely-eyed, let’s-look-honestly-at-the-facts-and-find-some-way-to-deal-with-them way. My personal experience has not been that traveling around the country is broadening or relaxing, or that radical changes in place and context have a salutary effect, but rather that intranational tourism is radically constricting, and humbling in the hardest way — hostile to my fantasy of being a real individual, of living somehow outside and above it all. To be a mass tourist, for me, is to become a pure late-date American: alien, ignorant, greedy for something you cannot ever have, disappointed in a way you can never admit. It is to spoil, by way of sheer ontology, the very unspoiledness you are there to experience. It is to impose yourself on places that in all noneconomic ways would be better, realer, without you. It is, in lines and gridlock and transaction after transaction, to confront a dimension of yourself that is as inescapable as it is painful: As a tourist, you become economically significant but existentially loathsome, an insect on a dead thing. How dreadful to be known as a revolutionary poet and yet write a tedious and boring autobiography. I’ve been thinking about reading WCW’s poetry but first decided to check his autobiography for any cautionary tales. And yes, they are legion—sexually harassing young girls with his college pal Ezra Pound, slinking along with various “streetwalkers,” ogling the nurses in his hospital (“well-made” with “powerful legs”). 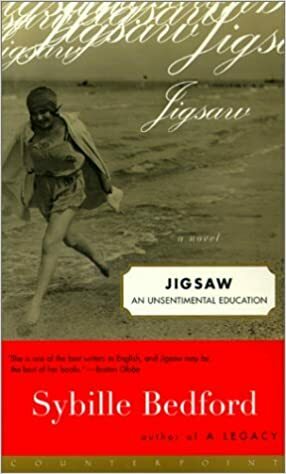 But there are bits of interest as well, such as words of wisdom from people who told him to keep studying medicine so that he could get an income while he worked on his writing (an abundance of plays and poems). Instead of enlisting in the military for WWI, he opts to remain home offering his services as a doctor, which were needed in the 1918 flu pandemic. He has the obligatory post-WWI jaunt through Paris and Europe, hobnobbing with Joyce, Pound, “Hem,” Ford Madox Ford, the usual tripe. On a return visit, he’s invited to tea at Gertrude Stein’s, and the toxic waste of his friends’ dismissal of her work bubbles to his lips and he actually tells her he’d burn her notebooks if he were her. (Later he comes to admire her work, so he does redeem himself slightly in my eyes). Mostly I kept reading for the all too rare tidbits about writing which, looking back, all seem to be clustered in the Foreword. There is a great virtue in such an isolation. It permits a fair interval for thought. That is, what I call thinking, which is mainly scribbling. It has always been during the act of scribbling that I have gotten most of my satisfactions. When and where did I or could I write? Time meant nothing to me. I might be in the middle of some flu epidemic, the phone ringing day and night, madly, not a moment free. That made no difference. If the fit was on me… I would be like a woman at term; no matter what else was up, that demand had to be met. Five minutes, ten minutes, can always be found. I had my typewriter in my office desk. All I needed to do was to pull up the leaf to which it fastened and I was ready to go. I worked at top speed. My head developed a technique: something growing inside of me demanded reaping. It had to be attended to. Finally, after eleven at night, when the last patient had been put to bed, I could always find the time to bang out ten or twelve pages. In fact, I couldn’t rest until I had freed my mind from the obsessions which had been tormenting me all day. Cleansed of that torment, having scribbled, I could rest. Once he got bitten by the theater bug in college, he wanted to write plays and wanted to see every available play that came through but had no money. But it was money that finally decided me. I would continue medicine, for I was determined to be a poet; only medicine, a job I enjoyed, would make it possible for me to live and write as I wanted to. I would live: that first, and write, by God, as I wanted to if it took me all eternity to accomplish my design. My furious wish was to be normal, undrunk, balanced in everything. One of the more idiotic tidbits to drop from WCW’s pen was this: “Spanish is not, in the sense to which I refer, a literary language.” Had he not been exposed to Don Quixote?